The focus of this article is not to summarize an academic study – just to employ good old-fashioned common sense, experience and intuition to offer observations for your examination and evaluation. Women are still stymied in their quests for higher education because of their family situations. Many women would love to pursue traditional degree programs. They understand the benefits of having higher educational degrees, but the social system and university bureaucracies often don’t accommodate those wishes. As time slips away for them in their home and family situations, they see the light of academic achievement fade and flicker. As they age, many women also express the desire to obtain education in a group of their peers as much as possible. They also view educational opportunities undertaken as another way to serve as good exemplars for their children. Military veterans now constitute a group struggling to achieve at college and reintegrate back into their communities and families at the same time. Nearly all veterans that I meet share a love and respect for inclusion, an American value. Vets have learned over time and through training to appreciate and value each other. Generally, they don’t care about color, race, creed, gender or any other way to divide and separate people. Veterans absolutely love education. They tend to be more educated than the general population for every degree level you can name. Veterans lead those achievement stats by 10 to 20 percentage points. But they need help in sustaining their studies as they work hard to regain their families and their lives before deployment. As to the relative degree of inclusion within universities, much progress has been made but more is needed. This is so perhaps because it is hard for just a few people to affect a sweeping culture change within these organizations. As a matter of fact, my experience is that it is easier to change the culture of a private for-profit company than it is to turn the rudder of a large university even two or three degrees toward a new culture of diversity and inclusion. Many large public universities are examples of hard and deep structure and vertical orientations. Favorable inclusion attitudes grow within soft structure. I applaud the leaders of these big universities because they are almost always far-sighted and gifted leaders who really care about their cultures. The real daily challenge lies at the rubber-meets-the-road level. LGBTQ faculty and staff increase in numbers but generally face the same stigma they did years ago. On the surface, Title IX and other regulatory mechanisms has given a durable support structure to what we say we believe in, but no law or rule can eliminate transgressions or change peoples’ mindsets – that’s a culture change, followed by constant maintenance programs to sustain those changes. Institutions of higher learning must examine their educational delivery models so that more women can achieve their goals of getting a college degree. It’s a well-known fact that more women, as child-bearers, are still the primary family care givers, housemakers and home attendants than men. Therefore, universities and colleges must shift quickly into more choices and options for online education, whether synchronous or asynchronous. Those professionals charged with designing diversity and inclusion programs within higher education must not only be the visible champions of equality of opportunity, but they must also enlist others under the same banner. 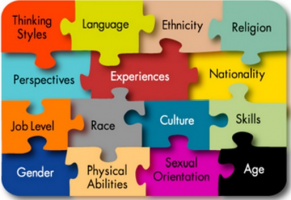 In the same way as a great leader builds and creates other leaders within the organization, the Vice President of Diversity and Inclusion must build and create proponents of their programs in very visible ways. There are so many ways to do that, ranging from inserting an inclusion component in another department’s program, project or event, or by creating events that attract a wide audience on the university’s campuses. These are positive and welcoming events and programs so that people attend and tell others about them. We should design programs that feature achievement awards for diverse students, faculty and staff members. Maximize the use of social media to spread the word about those programs and people. Match them up with mainstream mentors that are very eager to show their support. This can and should start at the very top of the organization. Most people will model the behavior of the leader, so this can be a very effective way to make real progress. The future is bright. Although minorities still have issues to contend with as they either seek education or manage the education process, we are better off now than we were during the last century. This is, however, a constant challenge and process. It requires much nurturing and effort to ensure real equality in an educational institution. Because there is no final victory, ensuring diversity and inclusion is a daily culture task on everyone’s part. Lead the charge, whether you’re in charge or not. Together we will win the daily battle. Author: Bob Brescia serves as an executive leadership consultant in Texas. His latest book is Destination Greatness – Creating a New Americanism. Bob has a doctoral degree with distinction in Executive Leadership from The George Washington University. He also serves as Chairman of the Board at Basin PBS – West Texas public television. Please contact him at [email protected] or Twitter: @Robert_Brescia.